Geek Squad is affiliated with Best Buy and provides extensive tech services. Geek Squad is a tech support subsidiary owned by the American consumer electronics company Best Buy. The service was originally set up to only provide assistance with computer-related issues, but has since grown to support all types of consumer electronics from cell phones to camcorders. 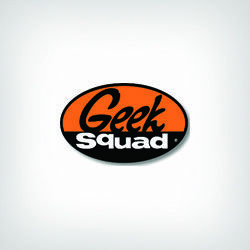 Geek Squad provides tech support in-store (Best Buy locations), on-site, and over the Internet, while also offering 24-hour telephone support. Geek Squad offers tech support services at competitive prices, but its standard plan only supports up to three devices. Geek Squad offers some of the lowest prices in the tech support business, with basic tech support services starting at $9.99 per month. This price point is less than half of what other companies charge for tech support, and comes with a full suite of service features, including premium internet security software at no extra charge, virus removal, and 24/7 support. Geek Squad customers have multiple channels through which to access tech support. They can schedule a time to visit a Geek Squad "precinct" at any Best Buy location throughout the U.S., Canada, Puerto Rico, and the Netherlands. Geek Squad precincts can also be found at select FedEx Office locations. If you have a device that is difficult to remove from your home (e.g., a desktop computer), Geek Squad representatives will come to you and fix your device on-site. Customers may also receive support remotely through their Internet connection, or chat with an agent over the phone. Geek Squad is one of the few tech support services we've reviewed that offers data recovery services, meaning if your device's drive has been reformatted, its files deleted, overwritten, or corrupted in anyway, or if the device itself has been damaged, Geek Squad will employ every available resource to ensure that your photos, documents, and music are recovered. While Geek Squad does offer exception services, its tech support plan only covers up to three devices. What more, tech support protection cannot be transferred to other devices, meaning you'll have to pay extra for more than three devices. Geek Squad offers a $100 discount on its one-, two-, or three-year plans when you buy a laptop, desktop, or tablet; however, this deal excludes Apple products and packages. Geek Squad does not offer a free trial with its services, but rather charges $99.99 for a one-time fix. Additionally, Geek Squad does not offer its services to businesses, small or large, but provides exclusive service to individual consumers. Geek Squad has earned our top spot because it offers a full array of tech support services on a wide range of devices for a reasonable fee of $9.99 per month. We also like that the service is willing to send agents directly to customer homes in the event of a tech support emergency; however, Geek Squad places strict limitations on the number of devices included on a single plan, and its data recovery option can be pricey in some cases. That being said, we can with confidence recommend Geek Squad to anyone seeking affordable, yet comprehensive tech support services. I was very fortunate to have a warranty on 2 of my computers. The first one, the backspace key of all things came off on a laptop. They had to send it out to replace the keyboard but it was a pretty painless process. For my desktop, the hard drive and the motherboard both went out at the same time. They replaced both and even upgraded my operating system to Windows 8.1 (from Windows 8) as part of the process in getting everything up and running. When shopping around for computer repair the customer service at Geek squad was very helpful in that they suggested some possible problems, ultimately went with micro center though due to pricing. I used Geek Squad at Best Buy to fix my laptop and they did a great job and got it back to work like it new. I would used the service again if needed to. I have used Geek Squad multiple times because they are close to me and they have never let me down. One time they took much longer than what was originally planned but I'm sure this was unavoidable and at the end of the day they did their job. Geek Squad has always been able to help me with my laptop issues! I would recommend Geek Quad service to anyone with a computer. Their service helps to keep a computer running smoothly! Geek Squad is great if you need something fixed with anything you bought at Best Buy. They're smart people, but somewhat lack in the people skills department. HP laptop got a virus. Tech remoted into computer to repair. He stated it would take about 1/2 hour. When he was completed, he called to say we needed to reboot the computer because he couldn't do it remotely. When computer was rebooted it was froze. Called Geek Squad back and they stated we would have to take it in the Best Buy. Took the computer in and they stated it would cost $49.99 to check it out. Geek Squad called next day to say the hard drive was bad. They could back up everything for another $100. They then put another hard drive in for even more $$$. 6 weeks later called Geek Squad back to find out where certain files were that they had downloaded from the saved hard drive. All of a sudden they stated the computer had a trojan virus. Never was told where these files where at while talking to them. Was then transferred to a tech (lady) who was obviously from another country. She stated that the virus was caused through our network and that it may have spread to all our home devices. She stated they could repair our computer (which we didn't even see any problems with) and offered us some sort of software security to protect all our computers, phones, IPads, for a mere $350 for 3 yrs, 5 yr for $549 or $700 for a lifetime. But the 3 yr. $350 wouldn't guarantee any new devices, only the ones we already have. We asked what about anyone that had used our network, she stated that there devices would be fine (really, how can theirs be fine but ours are not). We informed her that why was this not found when they had our computer 6 weeks prior when we paid them over $250. She stated that it might have happened after we got it back (Might have happened after we got it back) . We told her that we were going to wait on purchasing this and she transferred us to someone else that was still remoted in our computer (different person than we were originally speaking to that had remoted into the computer) the new person was also foreign, hmmm how did that happen. My husband asked him if he could log out of the computer now and he stated very rudely "I'm still logging out". I guess they didn't get all that commission they thought they were going to get, so now they can be rude. Never did find how to get those files back on our computer. Well Geek squad support will be canceled today. We are not going to pay a company every month for support that does nothing but drain you of more money.